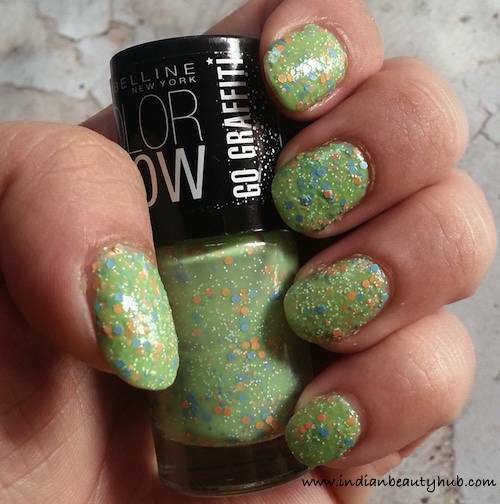 Hey everyone, today I’m reviewing a nail paint from Maybelline Go Graffiti Collection. The collection includes a total of 9 nail paints – 6 versatile top coats and 3 jelly type nail paints. 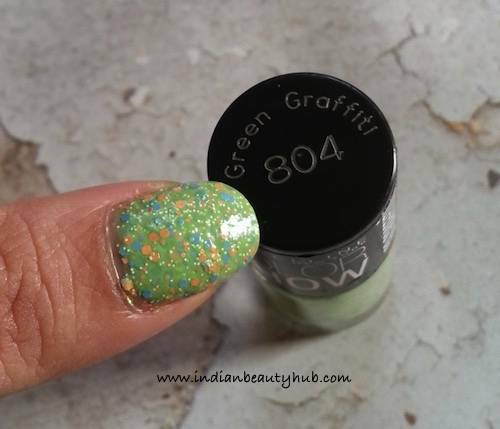 The shade I’m reviewing today is called Green Graffiti 804. 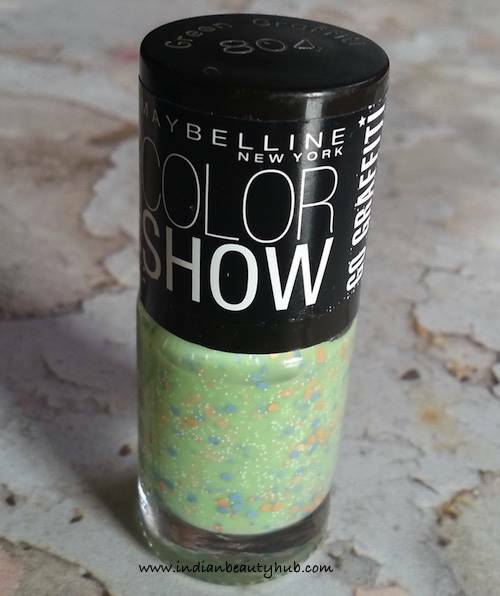 Packaging : Maybelline Go Graffiti Green Graffiti nail paint comes in the standard Color Show nail paint packaging – a clear glass bottle with a black cap. A good quality applicator brush is attached with the cap and the shade name & number is given at the top of the cap. 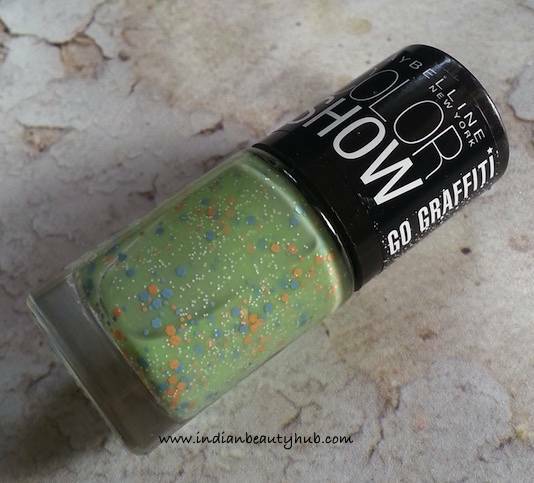 Price & Availability : The price of the Maybelline Go Graffiti Green Graffiti nail paint is Rs.145 for 6ml. 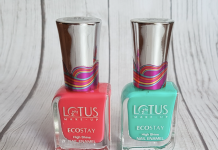 These newly launched nail paints are easily available at local beauty stores, Maybelline counters or you can buy these online from Nykaa.com, Myntra.com, etc. Shades Available : Flower Power, Blueberry Bombshell, Green Graffiti, Lucky Lavender, Star Struck, Pop-Goes-My-Heart, Blue Beats, Red Splatter, Unmellow Yellow. 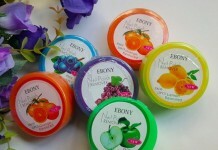 Efficacy : The nail paint has a little thick gel type texture, but it spreads easily on the nails. 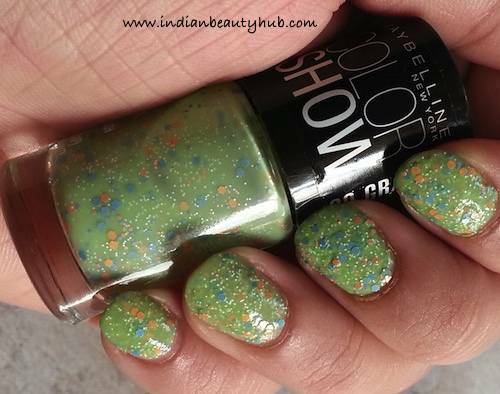 The shade Graffiti Green is a pretty pastel green and contains loads of white dots and orange & sky blue hexagon-shaped particles. 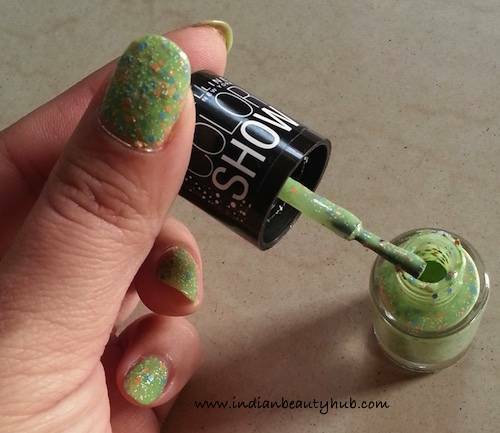 Green Graffiti is a quite sheer color and you need good 3 coat for that opaque look on the nails. Despite its thick texture, it dries pretty fast and you need not to wait in between coat applications. It sets into a glossy jelly finish and stays on the nails for 4-5 days without chipping. But I’m not liking this shade much as it makes my hands look darker. This particular shade will look good on fair skin tones. 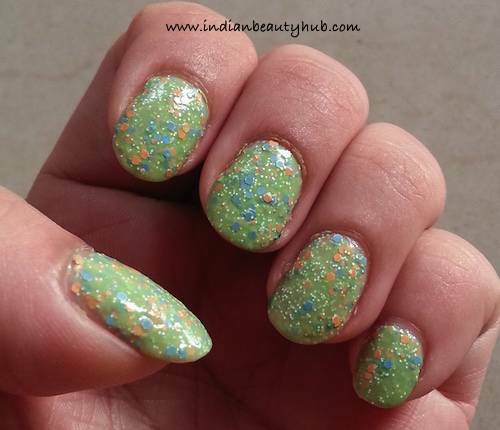 In the pictures, I applied 3 coats of Green Graffiti nail paint. Easy to use travel-friendly packaging. Stays on the nails for long. Gives very interesting finish on the nails. 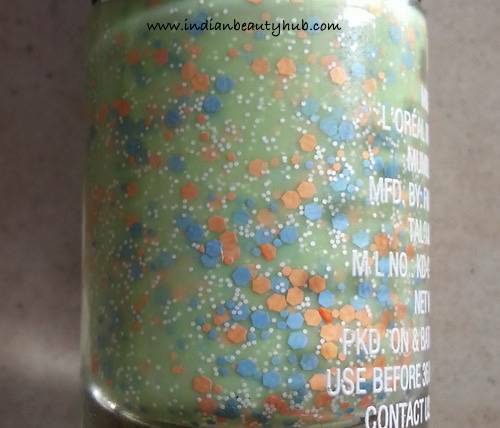 This particular shade will not suit all skin complexions. It’s quite difficult to remove this nail paint. 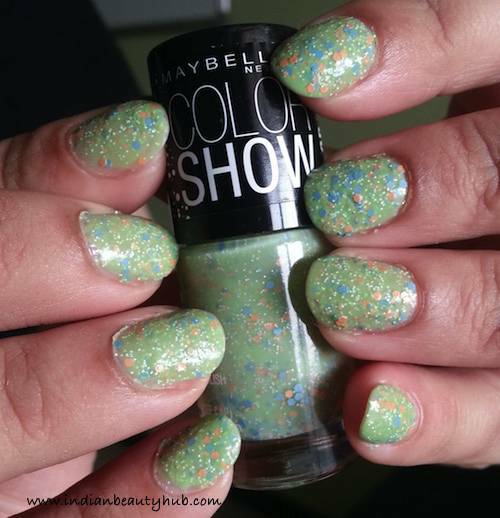 Overall I really liked the color, formula and finish of this Maybelline Go Graffiti Green Graffiti nail paint. It makes my hands a little darker. but still I'm liking it. 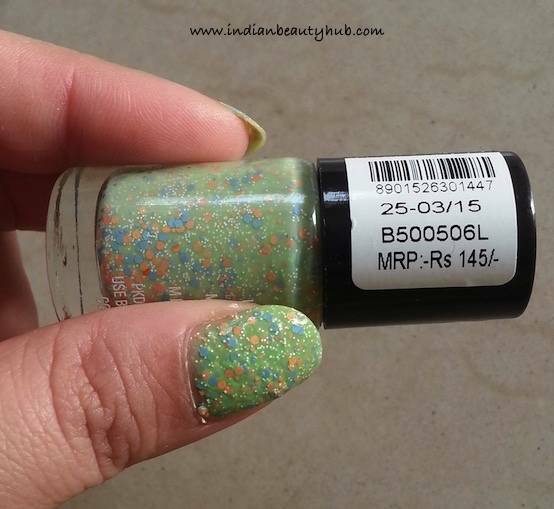 It is a worth trying a few shades from this newly launched range. Highly recommended!